In our last post, we studied the Biathlon, a winter sport that has shooting as one of the events. In today's post, we will study a summer sport, where shooting also plays a part. The sport we will study today is the Modern Pentathlon. The Modern Pentathlon has its origins in the modern Olympic games. You see, in the ancient Olympic games, there used to be a sport called the Pentathlon, where athletes competed in running, long jump, wrestling, throwing the javelin and throwing the discus. These five events were based on skills that were useful in battles of that era, therefore the athletes participating in this sport were considered very elite soldiers as well. When the modern Olympic games started in 1896, the founder, Baron Pierre de Coubertin, wanted a similar event in the modern Olympic games. However, since warfare tactics had changed since the ancient Olympic games, his idea was to create the modern Pentathlon, based on skills that were useful to a soldier of the late 19th century, specifically cavalry soldiers. He imagined a situation where a cavalry officer was trapped behind enemy lines and had to escape back to his own lines. To do so, a cavalry man must be able to run over a cross country course, swim, ride an unfamiliar horse through an obstacle course, fight with a sword and shoot with a pistol. The first modern pentathlon event was held in the 1912 Olympic games in Stockholm, Sweden. Interestingly, for many years, the Olympic games were only open to amateur athletes. Why? Some people claim that this was because Baron de Coubertin thought that ancient Greek athletes were amateurs and wished to copy the same principle in the modern Olympics. This is not true, because it was a well known fact that the winners of ancient Olympic events were paid huge sums of money and were set up for life. The uncomfortable truth was that Baron Pierre de Coubertin was an aristocrat and a bit of a snob. At a time when most people worked hard for a living, it was generally the wealthy upper classes that could afford to devote training time to sports, as "amateurs". Working class people found it hard to compete in the highest levels of sport, because of the need to go to work all week. However, as sports became more popular and attendances to sporting events increased, some competitions began to award monetary prizes, which made it attractive for working class athletes to skip work and concentrate on sports full time. This led to the first professional sports people of that era (e.g. professional baseball players and professional soccer players played for factory teams, professional runners competed against horses etc.). Baron de Coubertin didn't like the idea of a lower class professional athlete beating the pants off an upper class "amateur" aristocrat. Therefore, he made the restriction that the Olympic games were only open to amateurs. Over the years, many countries made a mockery of this restriction (for instance, most sportsmen from the Soviet Union, East Germany, China etc. were amateurs only in name, because they were full time athletes with the state supporting them, while they were officially enlisted in the military and were therefore considered as "amateurs") and in the late 1970s, the Olympic games slowly started to allow professional athletes in some events (e.g. the "Dream team" in Basketball for the 1992 Olympics). In the 1912 Olympic games, when the first modern pentathlon event was held, the amateur athlete rule was very much enforced. Only officers were allowed to compete in the event, not ordinary cavalry troopers. This was the case until the 1952 Olympic games, because ordinary cavalry troopers were considered as professional athletes, as they rode horses for a living! On the other hand, most cavalry officers of that era were from upper class backgrounds, and so they were considered "amateurs". The athlete who participated in the modern pentathlon event in the 1912 games for the US, was a young Army cavalry officer named George S. Patton. Olympic athlete and Army General, George S. Patton. Click on the image to enlarge. Public domain image. In case you think that name sounds familiar, yes, this same officer later rose to fame as one of the most famous generals in America! Patton did pretty well in the Olympic games, finishing fifth in the overall events (the top four finishers were all Swedish. Sweden was the host country of the 1912 Olympics). Interestingly, the event he did the worst in was one of his stronger skills: shooting. He finished 21st in this event. However, there is some controversy associated with his performance in the shooting event. As it turns out, competitors were allowed to bring their own firearms and many of them chose .22 caliber pistols. Patton, on the other hand, brought a revolver chambered in .38 caliber. This was because the standard US military revolver of that era was the M1892 revolver chambered in .38 Long Colt (the .45 caliber Colt M1911 pistol had just been adopted the previous year and was not delivered in large numbers to the US military yet). 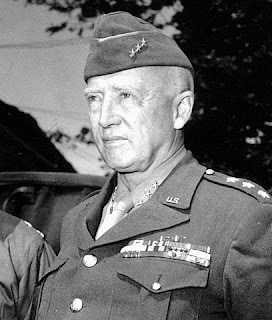 Patton claimed that the first few shots from his .38 caliber bullets produced large holes on the paper and some of the later shots passed through these large holes and the judges decided that he'd missed the target completely and subtracted points from his score. If his claim is true, it was agreed that he would have received an Olympic medal. Nevertheless, the judges ruling was upheld and Patton accepted their decision as a sign of good sportsmanship. In modern times, the background behind the target moves, so that the judges can specifically track multiple shots through the same hole. Patton was also selected to represent the US in the 1916 Olympic games, but they were cancelled due to World War I. These days, the modern pentathlon event has changed a bit. The shooting part was changed to use a small caliber air pistol and in 2009, they combined the shooting and running events, so athletes now have to run three 1000 meter laps, each prefaced by taking shots with a pistol until they successfully hit five targets. Once five targets have been hit, the athlete can resume running the next lap and so on. In 2011, the pistols were changed to use lasers instead of actual bullets, with an electronic device to provide a small delay between pulling the trigger and firing the laser, to simulate a pellet leaving the muzzle (the use of laser pistols instead of real pistols has created some controversy). Since 2013, the athletes shoot until they hit five targets and then run an 800 meter lap and repeat this four times. Unlike biathlons (which we studied in the previous post), athletes do not carry their pistols with them while they are running. Missed shots are not penalized and the only requirement is that the athlete should make five successful hits to the target before running again. The winner is the one that first crosses the finishing line. The modern pentathlon is still considered part of the Olympic games (at least until 2020) and there are annual world championship events held as well.